This post was originally published on SeekingAlpha.com. Investors often sell call options against their long-term equity portfolios to gain additional income (covered call strategy). 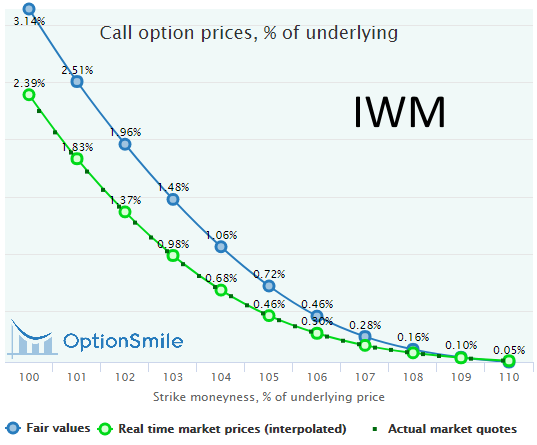 The analysis below demonstrates that call options are substantially underpriced in “oversold” markets. In such regimes, short call positions have mathematically expected loss and can be detrimental to the whole portfolio return. It worth suspending call selling is this condition until the market comes to its senses. 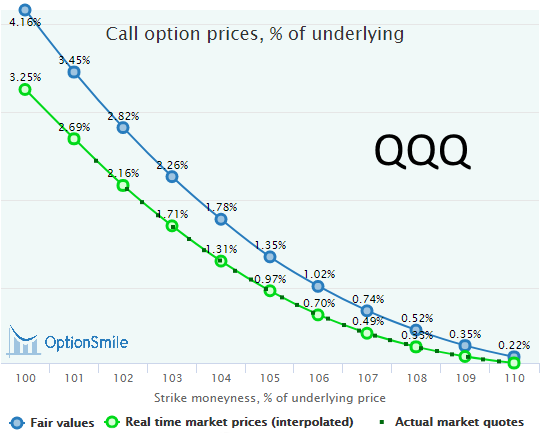 As a follow up to the previous article (Catching A Falling Knife With Put Options On SPY) devoted to the put options valuation in oversold markets, this one is about the other side – call options – in the similar market condition. The emphasis will be on the covered call strategy and the input that short calls make to the whole portfolio’s expected return. We will employ the methodology of options fair value estimation presented in this blog post: “What Is The Fair Price Of An Option You Buy Or Sell?” We wrote in that post that the fair Value of an option contract is equal to the probability of the in-the-money expiration multiplied by the expected option value is that case. Probabilities and expected values are derived from the historical behavior of the underlying security with some filtering, which is applied to select from the past only those data points that resemble the current market conditions. For more details about this filtering technique, please see here. Volatility Index (VIX) to select the same volatility regime as now. Relative Strength Index – RSI(14) to spot the short-term swing regime (oversold, in our case). The Conference Board Leading Economic Index to filter out the recessionary environment in the past (we select historical data when 6-month rate of change of LEI was above -2%). For your sample, we select 300 days in history when the market condition was close to the current one and calculate call options Fair Values on this basis. As it turns out these call options are underpriced by the market, especially near-the-money. The main reason for that is the price dynamics following the selloffs: the market more often than not bounces up sharply driven by the mean reversion force. The average SPY return in our 300-day historical sample of 1.81% per month (21.7% annualized). All that means the short call strategy has negative expected profit and, being combined with the long equity portfolio, can harm the SPY expected return. 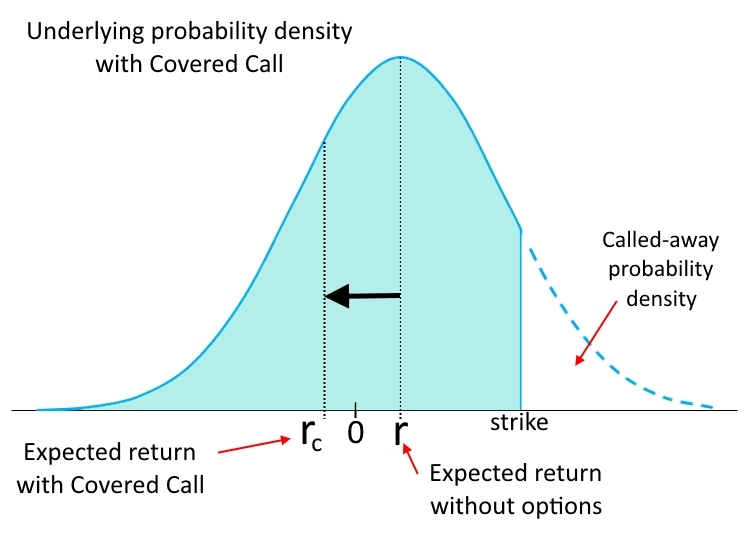 The negative expected profit of short calls means the following: After some number of similar trades, the total options premium collected is expected to be less than the lost income of the called-away underlying in the cases of in-the-money expirations. Graphically, it has the following representation. 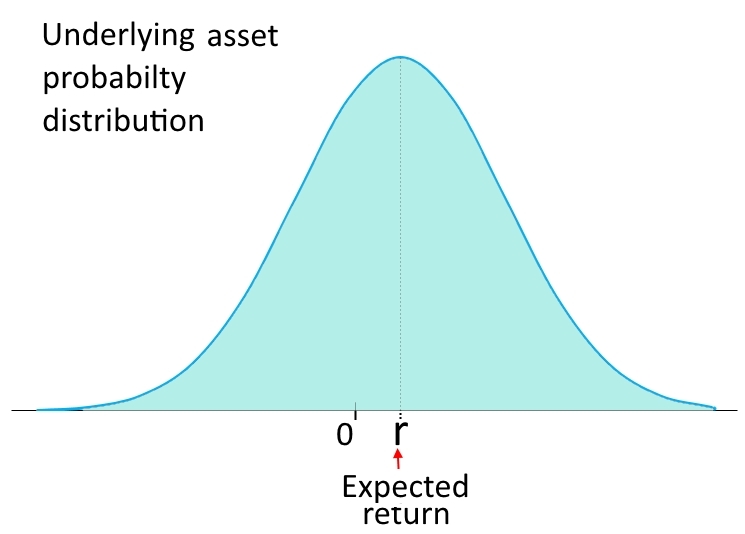 Without any options overlay, the underlying security returns have some probability distribution (for now, it does not matter what form it has) and an expected return – r – calculated by weighting all possible returns by their probabilities. For equities, this value is usually positive and exceeds the risk-free rate by some equity premium. If we start to “overwrite” the underlying asset with short calls, our security will be periodically called away in the cases of in-the-money expirations (when price exceeds the call strike). That will “cut off” the right tail of our probability density since we will not possess the underlying security in this zone when it is called out. So the probability of getting returns in this right tail will be zero for us, whatever that returns will be. That probability “cutting” leave us with more weight on the negative side and, hence, decrease the expected return of the underlying asset (r) moving it to the left (rc). In other words, negative returns will be less balanced with the positive ones. Theoretically, that loss of the expected return (r – rc) should be compensated by the premium collected from the calls sold. However, it takes place only if the short call strategy has at least non-negative expected profit, i.e., the fair value of a call option is less or equal to its market price. As we have seen above, it is not the case in our current market. 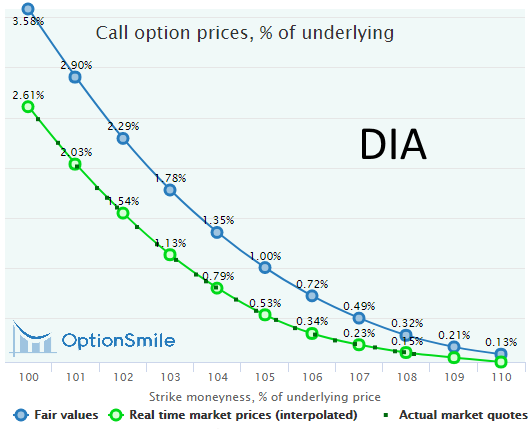 Call options prices are below their fair values and the called-out returns of SPY are not expected to be compensated by the short options premium collected, on average. Remember, the average SPY return in our historical sample is 1.81% per month, which is more than the expected Profit/Loss of all these covered calls. For instance, for the ATM covered call (100 moneyness), the expected profit is 0.71%, which is substantially less than the SPY return. In other words, such a “covering” eats up more than 60% of total expected SPY return (1.81%). Actually, it would substitute the whole positive SPY return with more meager call options premiums. The main outcome of this analysis is that it worth suspending the calls selling in such an oversold market regime to save the whole underlying equity returns. At the same time, it is important to note that covered calls usually do a good job in lowering the overall portfolio volatility. Call options on equity indices are priced quite fairly, on average (in contrast to puts), but selling them against the long underlying will lower the overall volatility of returns as well, see this research. 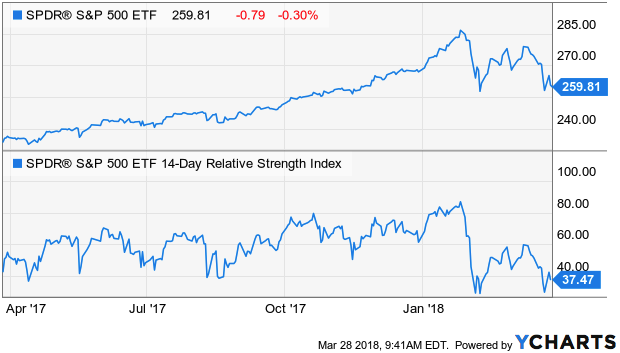 As a final note, let’s look at the current valuations of call options on other major ETFs on equity indices – IWM, QQQ, and DIA – with the same expiration date, April, 27. 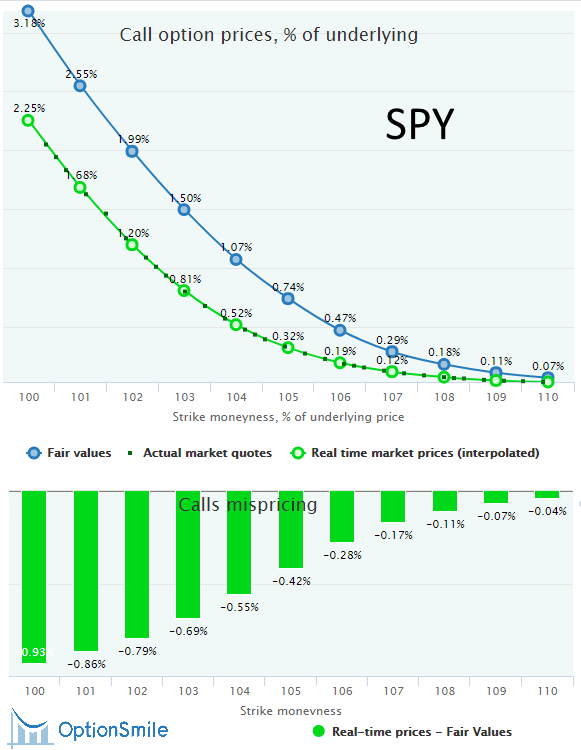 As we see, all these mispricing pictures are the same as with SPY: Call options are substantially underpriced by the market, short call strategy would have negative expected profit, and call overwriting would be detrimental to the overall portfolio returns.